What studio? Where were you broadcasting from? What equipment were you using? Who has that equipment? The sound was wonderful, before it cut out. It seemed to cut out when you went to share your screen. Did you figure out why it did that? I enjoy learning via Adobe Connect, so I’m curious. 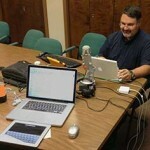 Looking forward to trying Google+ and Lync for our meetings too. Thanks for doing this! Hi Karen. Thanks for your interest in the behind-the-scenes production process of the Adobe Connect session. It wasn’t an actual recording studio but rather a makeshift setup done in the Ballard 104 room on the OSU campus. 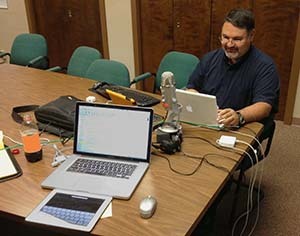 We presented the webinar using Adobe Connect 9, accessed via a Macbook (Victor) and Macbook Pro (Jeff). Microphone used was a Bluemic USB Yeti mic. It is owned by ECTU and one of the mics we recommend and support. It is available for OSU Extension use on a limited basis. You can contact us for more information. Hope that answers your questions. Glad you enjoyed the session. We too look forward to try out different ways of doing the meetings using other technologies so that people can learn not only about mobile device use, but online conferencing and education as well.